Happy Cinco de Mayo! I have another recipe in mind for today, but I just realized I am out of nuts and have to make a grocery store run. So until I come back with today’s actual recipe, here’s another good one — Mexican Chocolate Crunch Brownies aka Cinco de Mayo Brownies. The original version of the recipe was created by my friend Val, who used Cinnamon Toast Crunch cereal to make a crunchy, cinnamon-y crust for boxed brownies. 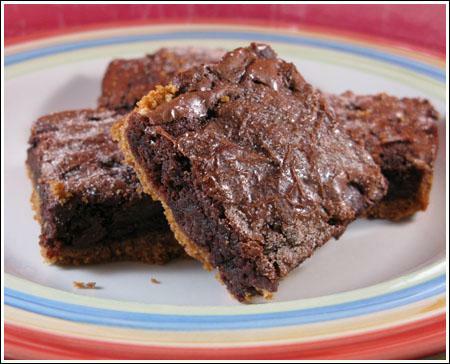 The crunchy crust really takes boxed brownies to a whole new level! What I do differently is line the pan with foil and chill the brownies so that I can make a nice, clean, cut. I also use slightly more chocolate chips and cinnamon. And finally, I always use a metal pan, but I suppose you could use glass. If you use glass, you might want to bake at 325 degrees F. instead of 350 for a bit longer (glass = slower plus lower). Fudge brownies with a crunchy crust made with Cinnamon Toast Crunch cereal. Preheat oven to 350° degrees F. Line a 13x9-inch pan with foil and spray the foil with cooking spray. Crush the cereal in a food processor in a zipper bag using a rolling pin. Put it in a large bowl and stir in butter and corn syrup until well blended. Press evenly into pan. Using the same mixing bowl, make brownie mix as directed on box, using oil, water and eggs and adding cinnamon. Stir in half of the chocolate chips. Pour brownie batter over cereal mixture. Sprinkle remaining chocolate chips evenly over batter. Bake 20 minutes. Sprinkle cinnamon-sugar evenly over brownies and bake 14 to 18 minutes longer or until brownies are set when lightly touched in center. Let cool completely. If desired, cool and chill (this gives you a cleaner cut). Lift foil from the pan and cut brownies into squares. What a great desert for cinco de mayo!